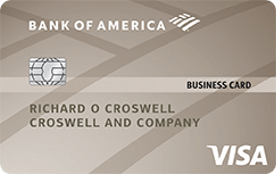 Depending on your credit history, the Bank of America Platinum Visa Business card may offer you a lower interest rate than what you can find on other business cards. The Platinum Visa card is one of the few credit cards around that still offers a minimum interest rate below 11 percent. It also offers a substantial sign-up bonus for a card with no annual fee and a brief interest-free period that can be helpful when you’re just getting started with a new card. However, it doesn’t offer a rewards program, nor does it offer that many business-friendly perks. As a result, the Bank of America Platinum Visa Business card ranks low on our list of business cards. Here’s what else you should know about the Platinum Visa Business card. The biggest selling point for the Bank of America Platinum Visa Business card is its below average interest rate, which could be a big deal for cardholders who know they’ll be carrying debt for some time. Bank of America charges Platinum Visa Business cardholders a minimum APR that’s well below what many business cards charge. The average business card, for example, charges a minimum rate of 14.43 percent, according to our weekly rate report. You could get hit with a much higher rate, though, if your business credit score is less than perfect. The Platinum Visa Business card also gives you some breathing room when you first open the card – which can be helpful if you need to run up some big purchases right away. Cardholders get seven billing cycles to carry a balance interest-free (11.49 percent to 22.49 percent thereafter). Finding promotional rates on business cards can be difficult, so the extra time to carry a balance without paying interest is appealing, even if it’s for a much shorter period than what’s typically offered on personal credit cards. The Platinum Visa doesn’t offer a 0 percent APR on balance transfers, though, so if you plan to transfer a balance transfer, you’re better off with a different card. Its 4 percent balance transfer fee (or $10, whichever is greater) is also relatively high and could cost you a substantial amount of money if you need to transfer a large balance. One of the few areas where the Platinum Visa Business card really shines is with its sign-up bonus. It offers a flat $300 statement credit if you spend $3,000 in the card’s first 90 days. That’s a sizable bonus for a card with no annual fee and helps make up for the business card’s lack of a rewards program – at least for the first year. The Bank of America Platinum Visa Business card also offers a modest suite of benefits that can help your business save money on travel insurance and keep better track of your expenses. Like most business cards, it offers free employee cards. It also offers a cash flow management tool that can help you keep track of your company spending. In addition, it offers a modest suite of travel insurance benefits that can save you money if your company’s travel plans go awry. For example, in addition to standard travel perks, such as car rental insurance and travel accident protection, the Platinum Visa card offers lost luggage protection to help you if you or your employees’ luggage goes missing. It also gives you the option to upgrade your benefits. However, if you travel heavily or have a big business, you may want to pick a premium card instead. Cards with annual fees typically offer a stronger suite of benefits. Why get the Bank of America Platinum Visa card? You want a basic, low rate credit card. You want a business card with an introductory APR on purchases. You want a substantial sign-up bonus without paying an annual fee. Charge at least $3,000 within 90 days of opening your card in order to claim your $300 sign-up bonus. If you use this card to spread out payments for a big purchase, try to pay back the purchase in full within seven billing cycles in order avoid paying extra interest. To take advantage of travel benefits, such as lost luggage insurance or car rental coverage, use this card to book flights and car rental expenses.